Term assurance pays out a lump sum should you die within the term of the policy. It is the simplest form of life insurance and normally the cheapest option to provide the level of cover you require. Term assurance doesn't contain any investment element, it simply promises to pay out if you die within the term. If you don't die within that time, you receive nothing. Because the term is limited the life company who insure you are betting that you (or most of their millions of customers) won’t die during the term hence the cover can be offered at a very low rate. Like your house insurance; it is not a good idea to be without life assurance if you have a partner or dependents who are financially reliant on you and your income. Like most financial products term assurance policies come with a variety of options designed to suit the different purposes for which they are used. The simplest option to understand is level or decreasing cover. In a level cover policy the sum assured remains level throughout the term of the policy. If you die on the first day of the policy you get exactly the same amount as you would if you die near the end of the policy term. A decreasing term assurance policy pays out more at the beginning of the policy than at the end. They are often compaired to a repayment mortgage where the capital outstanding is decreasing in line with the reduction in the death benefit. A term policy can also pay its benefit in one of two ways. 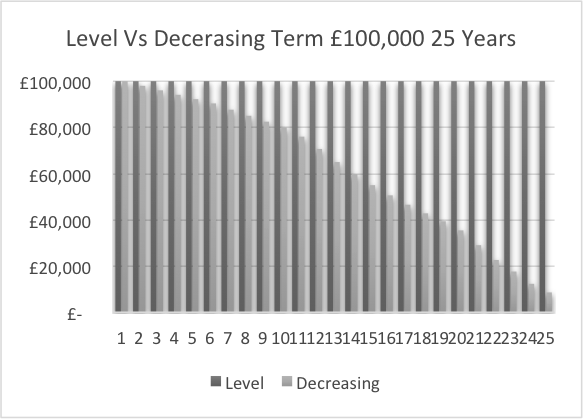 Most pay out a tax-free lump sum on death and some pay a tax-free income to the end of the term, these are known as family income benefit plans which are also similar to decreasing term assurances as each year the total benefit is reduced by another year that the income hasn’t been paid out. There are pros and cons to both, a lump sum policy can be more flexible because it allows your family to have a mixture of lump sum and income upon your death, but the income may be dependent upon investment returns at the time of death. A family income policy on the other hand is often cheaper because the liability is always decreasing for the insurer, for example, if you die in the 18th year of a 20-year policy, the insurers would only have to pay income for two years. It's also easier to work out the level of cover with this type of policy because you simply work out the income you would need to replace.